Unscripted moments that go badly can haunt a politician on YouTube during a campaign and into the future, but Palin’s ease with a rope line and her politicking skills are one of her best assets. A Palin campaign may not have a press bus or the more formal interviews that reporters crave, but her team will undoubtedly factor in added time for her to greet supporters and campaign not just in large rallies but one on one as well. 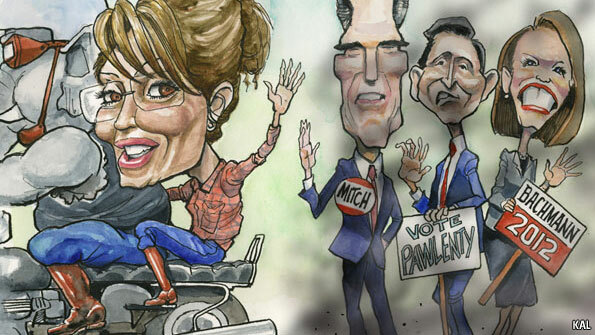 The one major trait of Palin that could doom her chances is her divisiveness. Everything from her comments post-Tuscon to her Tweets, she polarizes the political debate to awful extremes (sometimes even cultural ones). Andrew Sullivan made this ironic point when she moved to Arizona, a state bitterly divided between the white, conservative north and the Hispanic south. As governor, Mr Johnson showed that a non-ideological, pragmatic libertarianism can work as a governing philosophy. But neither full-blooded libertarians nor allegedly liberty-loving tea-party enthusiasts really care much about governing. Libertarians, accustomed to dwelling on the margins of American politics, participate in elections without hope of electoral success, if they participate at all. For them, presidential campaigns offer at best an occasion to preach the libertarian gospel to the wary public, and the more table-pounding the better. Johnson’s style – relaxed, calm, patient – is ill-suited to the times. His principles and beliefs challenge conservatives and liberals alike while offering nothing to the nationalist rassentiment that pervades the Republican party these days. Ron Paul’s movement is, fundamentally, based on emotion; Johnson makes the mistake of trying to appeal to reason. That won’t work this year. Gary Johnson by far is not the perfect candidate in my eyes but he looks better to me than Sarah Palin, Newt Gingrich, Hermain Cain, and Ron Paul. The again, those aforementioned have just about the same chance (not much) of winning the nomination.